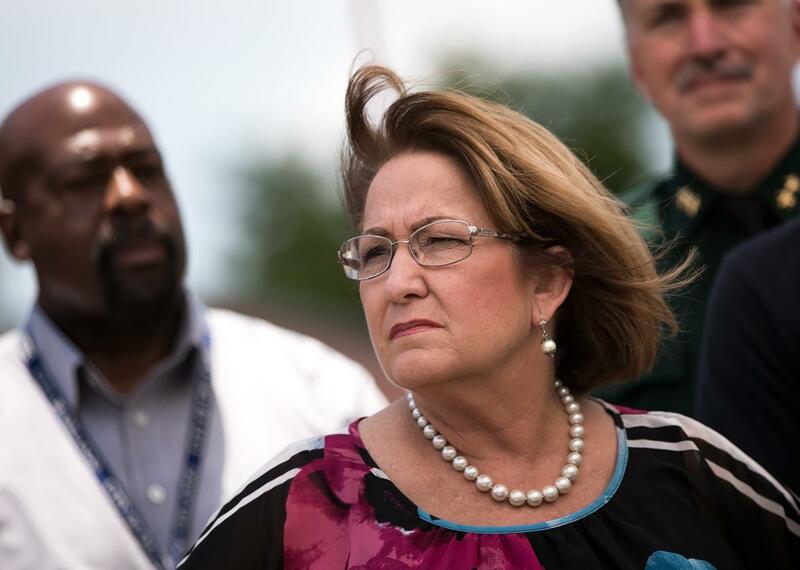 Orange County Mayor Teresa Jacobs listens during a June 15, 2016, press conference about the Pulse shootings. ORLANDO, FLORIDA—In the aftermath of the massacre at the Pulse gay nightclub on June 12, Orlandoans have been searching for words to make sense of the loss of 49 lives and to help reconcile present reality with a past belief that, as one resident put it, they lived in a “happy little town.” A majority—understandably grasping for some shred of positivity—have settled on love and unity. I watched many people write those exact words on makeshift memorials (posters, sidewalks, T-shirts, even a couch) across the city over the weekend. Shooter Omar Mateen being a notable exception, blame was relatively absent from the conversations I heard and joined. But at the One Orlando candlelight vigil on Sunday evening—a gathering that began as a small Facebook event organized among friends and ended up drawing around 50,000 locals to downtown Lake Eola Park—one speaker broke with the well-meaning platitudes to offer a necessary jolt of anger. And we, my generation and all of those that preceded us, we, we failed our brothers and our sisters, our sons and our daughters. We failed them when we were indifferent. We failed them when we were insensitive. And perhaps most of all, we failed them when we knew it was wrong, and we did nothing. If we’ve learned one thing, it’s that when hate is met with indifference, hate always wins. In many ways, my generation and the generations before were indoctrinated with beliefs and messages that fostered and perpetuated hate and prejudice, sometimes intentionally, but more often than not, without even realizing it. But today, enough is enough is enough! We cannot sit by and lose any more lives to senseless acts of violence. We cannot allow the deaths of 49 of our brothers and sisters to be in vain. We cannot let any more of our children grow up fearful—fearful of telling their parents, telling their pastors, telling their friends what is in their hearts. And we cannot let our children continue to grow up and lead secret lives—or even worse, lead hollow lives, all in an effort to be accepted and loved by the people around them. To our LGBTQ community, I tell you today, that you are not alone. You are not alone in your sorrow, and you are not alone in this fight. I am calling on every member of our straight community to open their hearts to acceptance, to embrace diversity, and to cherish our differences. A number of queer folks I spoke with in Orlando observed that, in the wake of the tragedy, straight people in their lives seemed to be experiencing a kind of revelation about how precarious and stressful being LGBTQ still is in America. “People are getting woke, right?” one man said, sighing. Amid a stream of messages of comfort and togetherness Sunday night, it was refreshing to hear one—especially from a straight person—of unflinching responsibility. Jacobs is right: Enough is enough. Read more Slate coverage of the Orlando nightclub shooting.